The Lupe stole silently into the shop, her presence betrayed by nothing except a shadow. And who would notice one shadow among so many, especially when its owner was so plain? A scruffy red Lupe of average size and build attracted no attention among the throngs of customers filing in and out of the doorway. All that set Taewaen apart was the adventurous glint in her eye. Invisibility and stealth were her strengths; living on the streets had made her strong. The life of a thief wasn’t easy, but she enjoyed it all the same. Quietly, Taewaen crept up to the counter, all the while eyeing the shopkeeper standing at the other end of the room. The Mynci was engaged in a heated debate with a blonde girl and was rather preoccupied with winning the argument. Seizing the opportunity, Taewaen snatched a warm hot dog from its place. Before anyone could cry out in alarm, she was gone in a blur of red, hidden in the commotion of the streets. In another area of Neopia Central, the summer sun beat down upon the back of a blue Uni trotting swiftly past the shop windows. A bag of groceries, clenched between her teeth, bounced with her rhythmic gait. She skirted the Rainbow Pool and jogged over toward the entrance to the catacombs, slowing only when she saw a dark-haired girl sitting against a nearby tree. “I’m back,” the Uni said, dropping the bag at her feet. The girl stood up and began fishing through its contents. “Looks good, Aurora. Did you spend much?” she asked. “Cheapest I could find,” Aurora said, tossing a small sack of neopoints to her owner, Blaze, who caught it deftly in one hand. Even with careful spending, the sack had grown much lighter since the Uni’s departure. “Okay.” Inwardly, Aurora sighed. Although she didn’t mind their lack of fortune, eating soup almost daily did get a little irritating. Even so, she never complained. “Oh poor you.” Aurora rolled her eyes, smiling at the thought of her owner overexerting herself by pushing buttons. Aurora wandered casually between the stores, the light breeze ruffling her mane. She gazed longingly inside some shop windows, others she passed by without a second thought. Unlike most Unis, Aurora had never really been interested in clothing and jewelry. And she would much rather settle down in a soft chair with a good book than push through a rambunctious crowd in Usukiland. Reading had always been a favorite pastime of hers. Unfortunately, she didn’t have nearly enough leftover neopoints for a book. She would have to settle for chocolate instead. Aurora entered the Chocolate Factory, smiled briefly at the clerk, made her selection, and began haggling. Several minutes later, she left the shop carrying her prize in a paper bag. Taewaen strolled aimlessly through the streets, stopping occasionally to take in her surroundings. She had long since finished the meal she pilfered from the hot dog shop, and was considering which was the best shop to visit next. Taewaen barely stopped herself from laughing out loud. She had escaped from the pound nearly a week ago; it was about time someone noticed. That was one advantage of being so plain. But at the same time, Taewaen wished she stood out more from other neopets, especially when she was in the pound. Few owners were interested in a common pet of a common color. Taewaen had long ago given up hope of ever finding a family, which is why she made escaping the pound a priority. Watching other pets get adopted was just a painful reminder of what she couldn’t have. Shaking herself out of her rumination, Taewaen looked at the notice again. The message itself didn’t worry her much. The description was too vague; no one would pick her out among the hundreds of red Lupes that passed through Neopia Central every week. Even if they did, she doubted the Defenders would waste time on her. Taewaen’s stomach rumbled, and she turned her attention back to her quest for dinner. Aurora had just carried her chocolate out of the shop when an uneasy feeling swept over her. It was a quieter part of town, and though there was no one in sight, she felt as if she was being watched. Glancing around, Aurora began walking towards the catacombs, all the while staying tense and alert. A flash of red on the edge of her vision was all the warning she received before the Lupe jumped at her. She felt the bag holding her chocolate being torn away, and immediately spun around. The Lupe might have escaped, but she had obviously underestimated Aurora’s reaction. In one swift motion, Aurora knocked the Lupe over and pinned her to the ground. Taewaen wasn’t quite sure what prompted her to attack the Uni, except that she had always had a weakness for chocolate. As soon as the Uni had walked out the shop door, the delicious smell had wafted over to her and made her hungrier than ever. So, acting completely on an impulse, she had darted over and plucked the bag out of the Uni’s mouth, not bothering to judge her reaction. And now, thanks to her carelessness, she was lying on her back staring into the eyes of a rather irritated blue Uni. “Give it back,” growled Aurora. “Make me,” Taewaen snarled around the bag, angry with herself for letting her guard down. “So am I,” said Aurora. The Uni’s tone was casual enough, but something about it still bothered Taewaen. “So? Buy another one.” She tried to sound sarcastic, but a note of uncertainty had crept into her voice. “You have a family, don’t you?” Taewaen asked quietly. “Well, just my owner, but yeah...” Aurora shifted uncomfortably. Taewaen only sighed. “You don’t get it, do you? Food means nothing if you have to sit there all day watching others get what you’ll never have. Besides, I can’t stand living in a cage. I’d rather have freedom than food.” Taewaen grinned. “Well, sorry I caused so much trouble.” She started to walk away. Taewaen tentatively picked up the bag. “Thanks.” Aurora began to walk away. “Wait,” Taewaen called out. “No problem. See you around.” Aurora turned and trotted away. “You probably wouldn’t believe me,” Aurora snorted, tossing her head when some hair fell in front of her eye. Blaze gave Aurora an odd look. “I said you wouldn’t believe me,” Aurora said laughingly, then shook her head. “Ugh, no thank you.” Aurora made a face. “Especially with us,” muttered Aurora. The setting sun had transformed the towering buildings, tinting them a fiery shade of gold. Taewaen barely noticed. Instead, she wandered aimlessly through the streets, no longer concerned with finding food. The last thing she expected was for someone to show her true kindness, much less someone she had tried to steal from. Though Taewaen knew stealing was wrong, she had grown so accustomed to it that she never really thought about what she was doing. Talking to Aurora showed her just how much she could hurt others without ever knowing. It also made her realize how desperately she wanted someone to be kind to her. Normally, she could avoid thinking about how lonely she was, except when she was trapped in the pound. But now, she couldn’t hide from the fact that she was totally and completely alone. Taewaen continued on, absorbed in her thoughts, absently watching the sun dip toward the horizon. Taewaen was so distracted she almost didn’t notice three pets that had just rounded the corner. Instinctively, Taewaen ducked behind the nearest bush. Two of the pets were obviously Defenders, but the third was partially hidden behind the others. All of them appeared to be looking for something. Or someone. Taewaen shifted uneasily. Watching the group warily, she weighed her options. They had already come too close for her to escape without drawing attention to herself, but if she stayed they would find her in a few minutes anyway. Of course, there was always the chance they weren’t looking for her. The third pet finally turned around, and Taewaen jerked in surprise. It was the Mynci shopkeeper from the hot dog shop. She stepped back, attempting to crouch even lower. She jumped again at the sound of a snapping noise. A broken twig left a small cut on her foot, and the noise had attracted the attention of the searchers. “Run it is, then.” Taewaen sprang from hiding and sprinted away. Taewaen managed to elude them for several blocks before her foot started aching. As the pain grew, her followers drew closer and closer. When they caught her a few minutes later, the Mynci was nowhere in sight and her other pursuers were gasping for air. With her injury holding her back, Taewaen was surprised it had taken them so long. One of the Defenders, a green Aisha, was the first to confront her. “We caught you,” she said, panting. “I can see that,” replied Taewaen, glancing at the second Defender. The orange Kougra was busy attempting to rearrange his costume after the chase. The Aisha was speaking again. “You’re coming back to the pound with us.” She tried to look intimidating and failed miserably. Taewaen looked down at her injured foot and gave an exasperated sigh. Getting caught was bad enough; the least they could do was pretend to be competent. By now, a crowd had begun to gather. Taewaen sighed again. Back to the pound. Blaze and Aurora strolled casually toward the Soup Kitchen, chatting amiably about nothing in particular. Just as they started discussing the Kadoatery and its irritating occupants, who were mewing quite loudly at the moment, a large gathering of pets caught their attention. “I have no idea,” said Blaze. “Come on, let's go see.” The two hurried over towards the commotion. “Oh no.” Aurora spread her wings and shot into the air, soaring over the crowd until she landed in the middle of the circle. “Hey, wait up!” yelled Blaze as she attempted to shoulder her way through the throngs of inquisitive pets. When she reached the center of the commotion, she saw Aurora standing next to the scraggly Lupe and glaring fiercely at the two heroes. The Aisha was returning Aurora’s glare while the Kougra was busy shaking the dirt off his cape. “Get out of the way!” The Aisha stood stubbornly with arms crossed. “So?” Aurora looked at her calmly. “So stealing is wrong!” The Aisha stomped her foot to emphasize her point. “True,” said Aurora, shifting her gaze in Taewaen’s direction. The Lupe pretended not to notice. “But everyone should get a second chance, shouldn’t they?” Aurora’s gaze bored right through the Aisha. “I’ll take her.” Murmurs ran through the crowd as all eyes turned to Blaze, who until then had gone completely unnoticed. “Actually, it sounds like a good plan to me.” Everyone started when the Kougra spoke for the first time. “Kyle!” The Aisha looked ready to explode. “The adoption probably won’t be official until you fill out some paperwork,” said Aurora. Taewaen, who had finally recovered from her initial shock, said, “You can find all the stuff at the pound, I think.” Aurora glanced at the other pet, who managed to look stunned and confused and reluctant and happy all at the same time. Blaze shook her head. “I already have a pet,” she said, pointing to Taewaen. “Me,” said Taewaen, who was looking happier by the minute, even though she still didn’t quite believe she was really being adopted. “How do you spell that?” Taewaen obligingly spelled her name. Blaze quickly scribbled out the rest of the information and pushed the form back to the Uni. 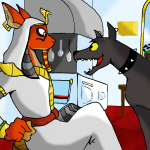 “I’m afraid the house only has one room.” Blaze grinned sheepishly. “Made of silver.” Aurora rolled her eyes. Five and a half rewrites later, my story FINALLY makes it into the NT! (Well, I hope it does... if you’re reading this I suppose it has...) Feel free to neomail me with any comments.